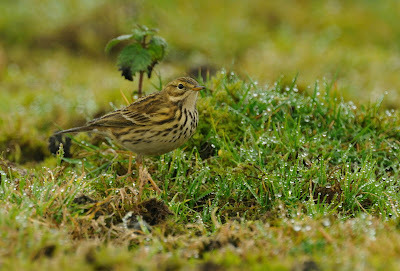 While the northern isles bathe in ultra rarities, the best I can offer this weekend are some shots of Meadow Pipit ! 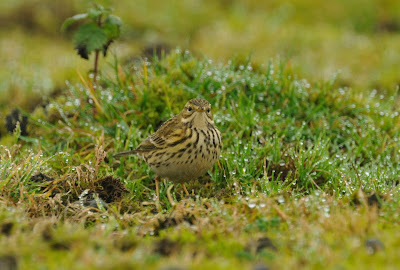 I had in the back of my mind Buff-bellied Pipit but just couldn't pull it out of the hat! 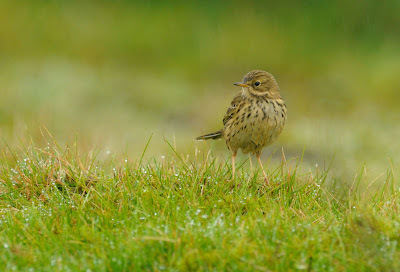 These three images were taken on Davidstow this morning in mist and drizzle. The ISO was increased to 1000 just to give 1/160s shutter speed. Needless to say, I didn't hang around too long here and headed back west where the sun was actually shining. I'll post some more images from Marazion Beach tomorrow. EXIF Detail: Aperture F/8. Exposure -o.3EV. ISO 1000. WB Cloudy. Focal length 850mm. Steve - If i do 251 it'll be a b***** miracle!!! cracking photo's in poor weather. For me the rain drops enhance the photo's. Fabulous Steve... the light and rain drops make these shots.